You have a lot of options for booking a car rental - none better than booking right here on hertz.com. 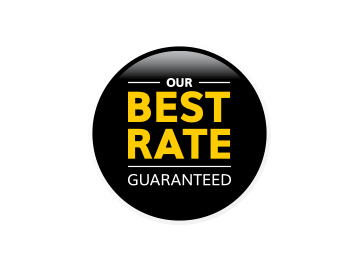 It's when you'll always find our best rate - guaranteed. Found a lower rate on a Hertz car rental? We'll match it and give you 10% off of that base rate. 1. Book and confirm a daily, weekly, or weekend car rental on hertz.com. 2. If you find a better rate online price for Hertz with the same pick-up and return locations, reservations dates and times, booked from the same source country, and your rental car type for the same vehicle within 24-hours of your booking on hertz.com. Simply send us a claim. 3. After we verify your claim, you will receive that rate plus an additional 10%. Remeber, rates change oftern. Ifa lower rate is found on hertz.com, the new rate will be honored, but the 10% discount will not apply. Rate from other car rental companies. Rates obtained through use of discounts, coupons, upgrade offers, pre-negotiated (e.g. group, government, corporate, tour, insurance replacement rental or in some cases online travel agencies)or similar rates. Car rental components of inclusive, package or other bulk, bundled or similar non-retail rates. Pre-paid, discounted rates (whether found on or outside of Hertz.com) cannot be compared to non-pre-paid (“pay later”) or pre-paid, discounted (“pay now”) rates obtained from Hertz.com. The Best Rate Guaranteed applies to the "base rate" of the vehicle, and will not include taxes, fuel, surcharges or any other ancillary charges. Only daily, weekend, and weekly rentals ore available. Other rental lengths ore excluded. Applies to rentals at participating locations in the Urited States ond Canada. A reservation must be made at least 72 hours in advance of your rental by going direct to Hertz.com ond bookong the lowest available rote for that rental car type. You must also provide us with evidence of the source of the rote on the claim form. Included but not be limited to: (i) rental and return date and time; (ii) pick-up and return locotion must be same location): (iii) vehicle type; (iv) lower fare amount; and web address (URL to the source's website in the Questions/Comments area). From the evidence provided, we must be able to verify the lower online published rate is not available at hertz.com. We will clarify the comparison rental car rate within 48 hours of receiving your claim ond notify you of the results. If the evidence provided is insufficient to verify the cloim, we will contact you to provide us with additional evidence as necessary. If additional evidence is required, it must be provided in o timely manner or your claim moy not be verified before your rental. You shall be limited to six (6) Best Available Rate Guarantee claims per calendar year. Any modifications, chonges or cancellations made to on existing booking that has on associated Best Available Rate Guarantee claim will result in voiding of the claim. Hertz reserves the right to modify the Best Available Rote Guarantee terms or to restrict its availabitity to one person at any time for any or no reason, ond without prior notice or liability. Hertz reserves the right to deny or reject a claim as a result of a Hertz or third party printing, technical, or other error or where such claim is in our sole discretion made fraudulently or in bad faith. The failure by Hertz to enforce any term or condition shall not constitute a waiver of that or ony other term or condition.